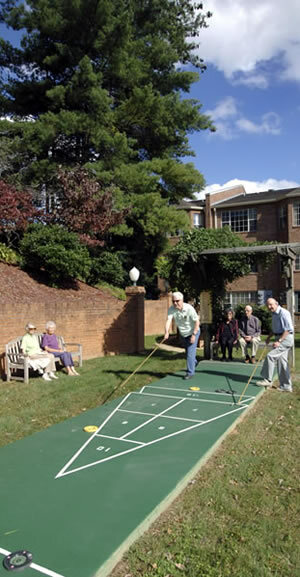 Fletcher Park Inn has a wide variety of enriching, exciting activities for the enjoyment of our residents. Take a day trip to Gatlinburg or down the nearby Blue Ridge Parkway. Enjoy our “Fun in the Sun” activities where you and your friends can play one of many provided games, like shuffle board, croquet or corn hole. Get a taste of our local community restaurants through our “Out to Lunch Bunch”. You can even gather in the Uppper Room or First Floor Assembly Room for Prayer and Bible study. Spend some time at the Lelia Patterson Fitness Center and become a 100-mile swimmer or learn the fastest growing game with retirees–pickleball. Enjoy one of the many cultural events of our area including theatre at the Flat Rock Playhouse or a concert at the well-known Brevard Music Center. Let Fletcher Park Inn become your retirement community. We will meet your needs and help enrich your life!